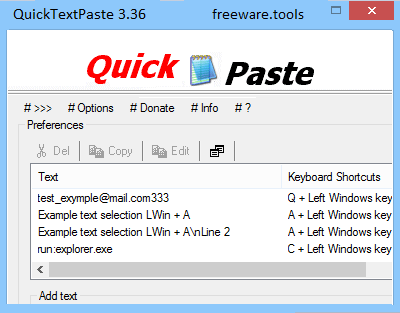 Quick paste text is a small portable program that allows you to insert (paste) quickly pre-defined text in any Windows applications via keyboard shortcut. This program also allows you to run commands and programs via keyboard shortcut. Save time and spelling errors with this small Desktop Tool for Windows. Quick paste text does not require installation, can easily be launched from the desktop with no installation and is ready to use on all Windows operating systems. In other words, this is a tool that allows you to create easy to remember hotkeys that can help you save time and avoid spelling errors by using this lightweight desktop application. QuickTextPaste is a lightweight software application whose purpose is to helps users paste predefined text messages using hotkeys. You can copy it on any USB flash drive or other devices, and take it with you whenever you need to automate the task of pasting text messages on the breeze, without having to go through installation steps. It sports a clean and intuitive layout that allows you to set up the dedicated parameters with minimum effort. The program gives you the possibility to add a new preset text in a dedicated pane by simply typing it in or pasting it from other third-party utilities. What’s more, you are allowed to assign a hotkey for each predefined text added to the list, as well as delete, edit, or duplicate the selected text. Additionally, you can make the utility run at Windows start up. Since there aren’t many configuration settings even less experienced users can master the entire process with minimum effort. It doesn’t eat up a lot of CPU and memory, so the overall performance of the computer is not affected. As a conclusion, QuickTextPaste seems to be the right choice in case you are looking for an easy-to-use application that allows you to paste predefined text using user-defined hotkeys. It can be easily installed and configured by all types of users, regardless of their experience level.